Home chemistry difference What is an isenthalpic process? An isenthalpic process is a process that runs without any change in enthalpy. Enthalpy is the thermodynamic quantity used to measure energy in a thermodynamic system. It is commonly denoted by letter 'H'. U = Internal energy of the system. In short, the process is said to be isenthalpic if there is no movement of heat to or from the surroundings, no work is done on or by the surroundings, and the kinetic energy of the fluid remains steady. Enthalpy in the initial state = Enthalpy in the final state. The isenthalpic process is adiabatic in nature. 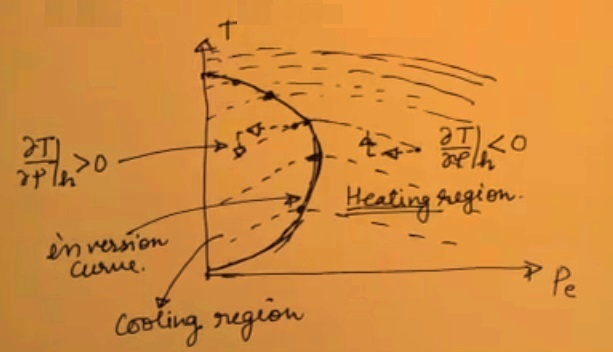 In thermodynamics, an adiabatic process is one that occurs without transfer of heat or matter between a thermodynamic system and its surroundings. Throttling is a good example which comes under the isentropic category. It is an adiabatic process. What is the throttling process? A throttling process is a process in which there is steady enthalpy from the initial state to final state, the work done is negligible or zero and the process is adiabatic. An ideal gas flowing through a valve in mid position can be explained by the laws related to throttling. If you remember the enthalpy formula stated above, H = U + PV, we can say that if pressure decreases volume increases in a process where U is assumed constant. The same thing happens in this example also. Thus W = 0 that is no work done. The experiment depicts that the isenthalpic process is an adiabatic process.